This page describes MSK(Minimum Shift Keying) and GMSK(Gaussian Minimum Shift Keying) modulation techniques. It covers GMSK modulator and GMSK demodulator based on QPSK modulation method. GMSK is the derivative of MSK modulation scheme and MSK is derived from Offset QPSK modulation. In MSK modulation scheme instead of rectangular pulse wave; half cycle sine wave is used. Frequency of logical zero and logical one differs by half of data rate. Modulation index is 0.5 here. MSK modulation mathematical equation is outlined below. 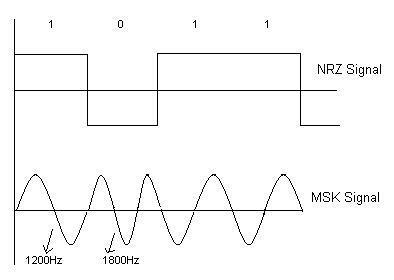 MSK modulation waveform is depicted below in figure for NRZ data signal. Gaussian Minimum Shift keying or GMSK modulation scheme is used in GSM/CDPD (Cellular Digital Packet Data) technologies. There are two main methods to generate GMSK. The first one is FSK modulation and the second one is QPSK modulation. The first one is based on GMSK VCO architecture and is not ideal for coherent demodulator. We will discuss second type used in GSM depicted in figure 3 and 4 below. Figure 3 mentions GMSK modulator and figure 4 mentions GMSK demodulator. As shown in the GMSK modulator Gaussian filter is applied to NRZ signal after it is passed through integrator block. This gives Φ. By applying COS and SIN function to this Φ gives out I and Q components which bits with cos and sin function respectively using mixing function. Both the chains are summed up and will give out S (n). The same process is understood well by trigonometric equation mentioned in Fig.3. As shown in fig.4 GMSK modulator basically derives back Φ using arctan function, which is applied to derivator block to obtain NRZ signal back. 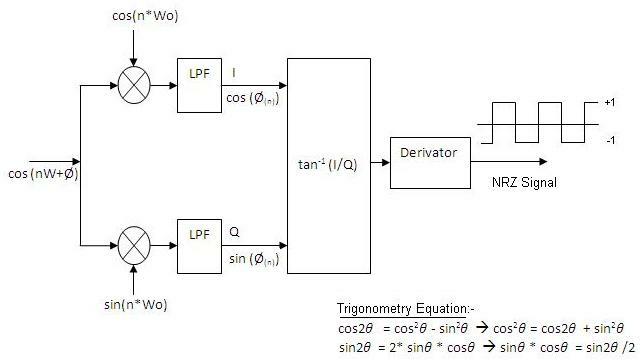 Before doing this mixing and Low pass filtering is done to obtain I and Q components from two chains.The same is understood well by trigonometric equations mentioned in fig. 4. 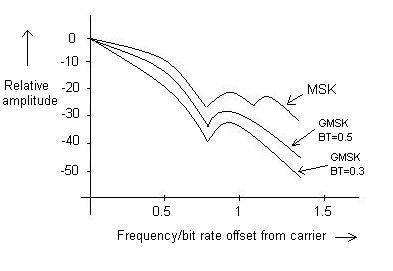 Bandwidth efficiency for MSK and GMSK is 1 bit/s/Hz also known as spectral efficiency. Figure 5 below depicts MSK, GMSK waveforms. Advantages- Modulated carrier in MSK contains no phase discontinuities and frequency changes occur at zero crossing of carrier. This helps in keeping PAPR low hence do not require highly linear power amplifier. GMSK spectral efficiency is better than MSK as shown in figure 5. Also it has reasonably less demodulator complexity. Disadvantages- Power spectral density of MSK does not fall fast hence will not reduce interference completely between adjacent channels. Hence GMSK is designed with various BT factors. BT of 0.3 gives good rejection against adjacent channels as the curve fall fast as shown in figure 5.